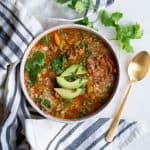 Black beans, chipotle peppers, spices, and veggies slow cooked in a delicious and super easy soup!! A perfect weeknight meal that can be prepped in 5 minutes. 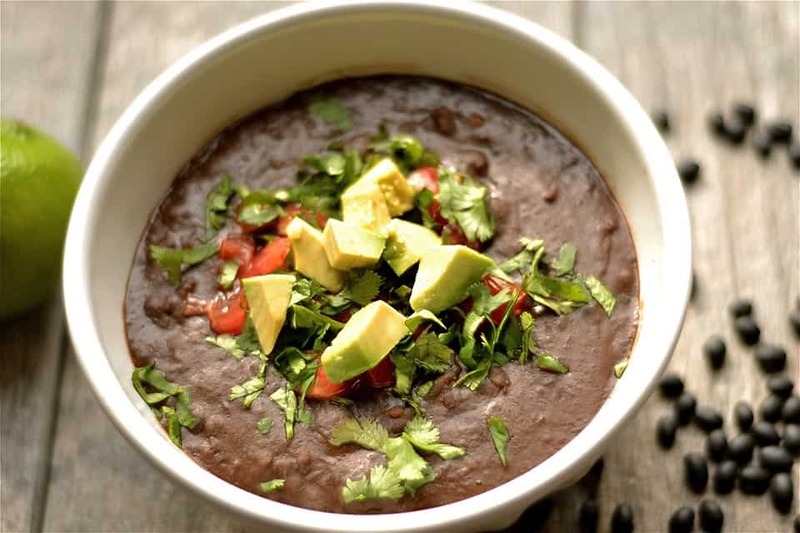 Smoky Chipotle flavor and sweet potatoes add the perfect combination to black beans. And topped with fresh lime juice, avocado, and cilantro; you really can’t go wrong! Alright guys, I’m going to let you in on a little secret about my cooking. 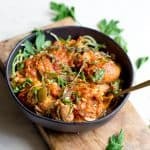 Sometimes, I throw a bunch of things in the slow cooker that I think *might* work well together, and cross my fingers in hopes that it turns out to be delicious. I’ve only had a few fails, sometimes it works okay if I add different flavors, and other times it’s absolutely perfect. Such is the case with this black bean soup. My Carbivore 8 year old is obsessed with all things beans. It’s her favorite protein, and since she loves her sugar and carbs, I am always offering her beans for a nutritious balance. She Loves refried beans, my curry lentil soup, BBQ chicken soup with black beans, and just a big serving of BBQ beans in her lunchbox. 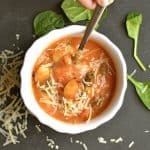 I knew this bean soup would be right up her alley! And it was. She and her brother loved it, and brought it to school for lunch twice this week. It also made such a huge pot, that I ate it several times this week for lunch. Easy to freeze as well! This was really so easy to throw together also. I mixed together some spices in a small bowl, and chopped some onion and sweet potato. 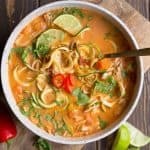 All of the ingredients were thrown in the slow cooker together, and cooked on low for 6 hours. Once done, I added lime juice and blended some of the beans together in a blender. This created a nice texture of smooth and chunky. 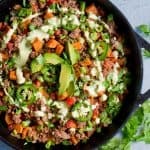 Serve with avocado, fresh cilantro, and any other toppings of your choice! 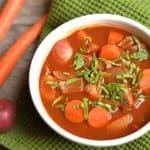 Place beans in slow cooker. Top with broth, sweet potatoes, onion, garlic, tomatoes, chilies, chipotle peppers, and adobe sauce. In a small bowl, mix together spices. Add to black bean mixture. Give all the ingredients a quick stir. Set your slow cooker to 6 hours on low. At the end of 6 hours, add in lime juice and chopped cilantro, and salt to taste. Please note that all slow cookers are different. It may need additional time to soften the beans, or change the setting to high. Mine cooks perfectly on low for 6 hours. Blend half of the soup mixture with an immersion blender (or regular blender). 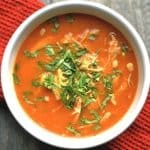 This step is not necessary, but gives the soup a partly smooth texture. 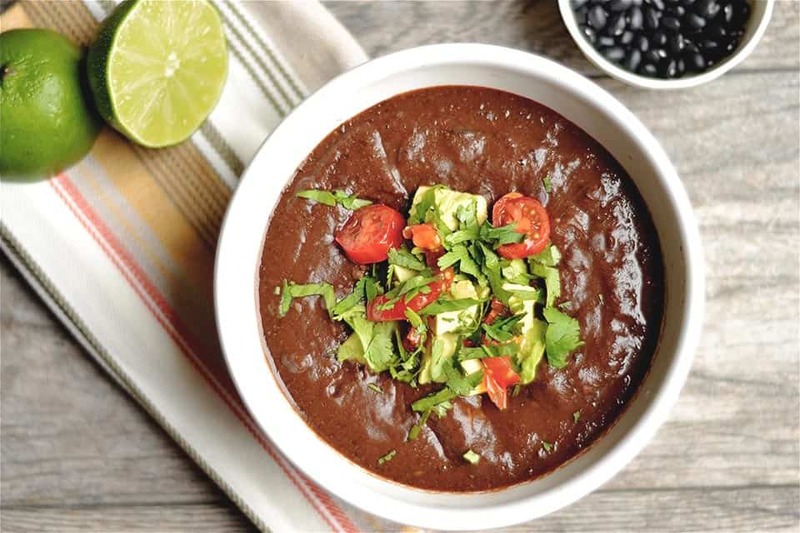 Serve hot with your favorite toppings (avocado, green onion, tomatoes, or more cilantro). Dried black beans do require soaking. I will sometimes soak overnight. For this recipe I forgot to soak, and it turned out great giving it a more "earthy" taste. It's up to you! Made this last week for the girls. Used canned black beans (2…undrained) and cut down the chicken broth to 1 cup. Blending 1/2 the soup is GENIUS! The consistency was perfect…and we all loved the smoky taste of the chipotle peppers. Thanks Amy! We added lime, avocado, and sour cream for the finish. Leftovers were even tastier! Sorry about that Karen! Set it to low for 6 hours. High for 3-4 hours. Oh my word this looks amazing – I will try it this weekend! Any thoughts on if it would work in the instant pot? 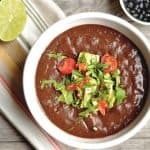 Can you make this with canned black beans? Any reason you prefer dried over canned? Oops, just saw the previous posts…thanks all! Making this tomorrow.